The State of Hawaii was shut down on Friday in expectation of two hurricanes threatening the islands. For the first time since I can recall, Holy Mass was also cancelled at most churches throughout the island chain. 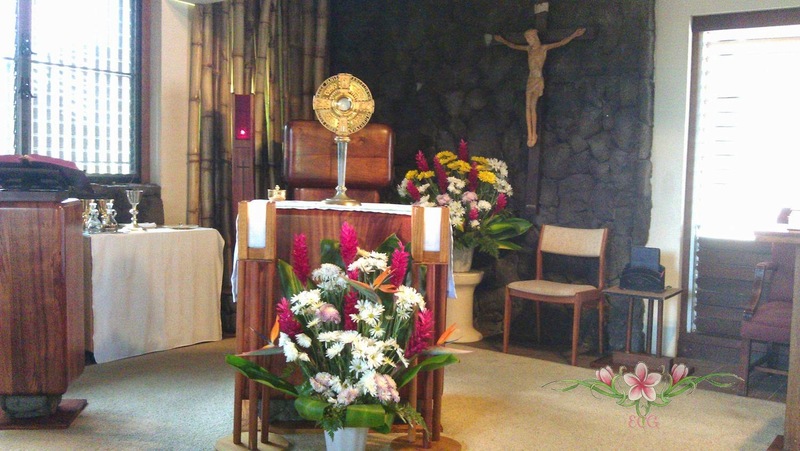 However, in the late afternoon a friend text-ed me that there would be a Holy hour of adoration as well as mass that evening, at nearby Star of the Sea Church. For those who attend daily mass, it was a very strange feeling not being able to go to Mass. A friend quoted Saint Padre Pio to remind us that it is a privilege to be able to attend Holy Mass: "It would be easier for the world to survive without the sun than to do so without the Holy Mass." So off another friend and I went to adoration and Holy Mass. We wanted to give thanks to God for once again sparing Hawaii from any devastation and to pray for the Iraqi Christians persecuted relentlessly for their faith. Apparently, we were not the only ones as the small chapel was filled to capacity. The reason I referred to no coincidences with God is because as I picked up a book to recite prayers the following prayers were what I found. We love, welcome and need You. storms, tornadoes, hurricanes, floods, fires and earthquakes. so Your Sacred and Her immaculate Hearts may reign supreme, granting us and the World True Peace. Glory be to the Father, Son and Holy Ghost. Amen. assist me in this my necessity. O Star of the Sea, help me and show me herein you are my Mother. to succour me in this necessity; there are none that can withstand your power. "Thy Kingdom Come." Actually, what could be better for the world than that the Kingdom, which Christ came on earth to establish, should be founded everywhere and should flourish wherever it would exist. That by His peace, love and law it may reign supreme all over the world, especially in our own native land which is naturally so dear to all of us. We must remember too, in our prayers those countries where religion is so cruelly persecuted by the enemies of God what prayer is the mightiest arm we can use against them. If all the millions who would each send up to the Throne of God this burning petition "Thy Kingdom Come" what help would not all countries each receive that are now so cruelly treated! Excerpts from Read Me or Rue it. by Father Paul O'Sullivan, O.P. This blog shares daily reports from the Aid to the Church in Need on the persecution of Christians, in the middle east, Africa, Asia and other parts of the world. Right now, there is an urgent need to help the Iraqi Christians. We are so far away so all e can pray, make sacrifices for them and we can send money to fund Catholic organizations that will indeed bring aid and assistance to those Christians. Imagine, how desperate their situation must be, how isolated and abandoned they must feel. Each days the reports of what ISIS is doing to brutalize these Christians grows more horrific. Let us show them in our small way that they are not alone. God is with them. Let us be His instrument in their time of need. You can safely make a donation online HERE.